The Human Genome Meeting 2017 (HGM2017) was held in Barcelona from 5-7 of February. This is the annual conference of the Human Genome Organisation (HUGO), a major scientific conference for human genetics & genomics, genomic medicine, and genomic biology. Ivo Gut, director of the CNAG, chaired the Local Organizing Committee which also included Jaume Bertranpetit (Institute of Evolutionary Biology, IBE), Elias Campo (Hospital Clinic, August Pi i Sunyer Biomedical Research Institute, IDIBAPS and University of Barcelona, UB), Joan Comella (Vall d’Hebron Research Institute, VHIR) and Manel Esteller (Bellvitge Biomedical Research Centre, IDIBELL). 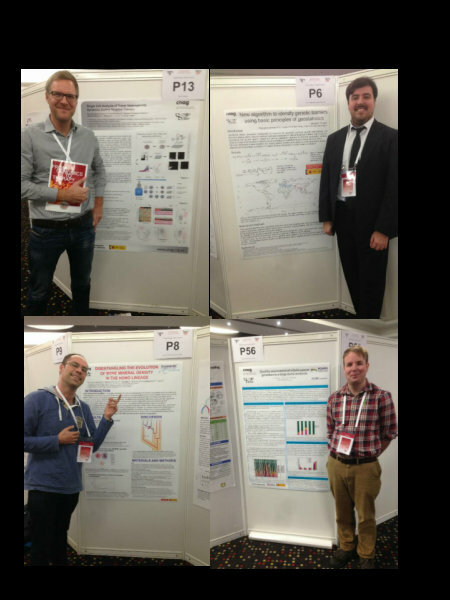 The CNAG actively contributed to the scientific program of the meeting with two invited speakers, several oral abstract presenters and poster presentations. Tomàs Marqués-Bonet, the CNAG and IBE Comparative Genomics group leader was invited to give a presentation in the Ancient DNA and Population Genomics session. He presented his results on great apes genome diversity and population history. In the following session, Gian-Andri Thun, postdoctoral researcher in the Biomedical Genomics group gave a short presentation on the insights into regulatory variation of gene expression in bronchial brushings of individuals with and without airway obstruction. On the second day during the Cloud Computing and Data Sharing session Steven Laurie, data analyst at the CNAG, presented the RD-CONNECT platform which aims to accelerate rare disease research and facilitate data sharing through measures such as the GA4GH Beacon network and GA4GH/IRDiRC Matchmaker Exchange. Marc Martí-Renom, leader of the CNAG and the CRG Structural Genomics group was invited to present his research during the Distinguished Spanish speaker’s session and showed his findings on structure determination of genomes and genomic domains in function of spatial restraints. Finally, Miranda Stobbe, postdoctoral researcher in the Biomedical Genomics group, presented on the non-randomness of somatic mutations in cancer genomes using the ICGC Pan Cancer dataset.